szboudreau01 asked me if I could share my skin template making method with everyone, so I'm making this tutorial. First thing first you're going to need Photoshop or any other image editor that good at working with layers. I recommend getting latest Adobe Photoshop. You can find it at the Pirate Bay or other warez site. Take care to download cracked version of Photoshop, not the portable one, since you're going to need to install at least one plugin. 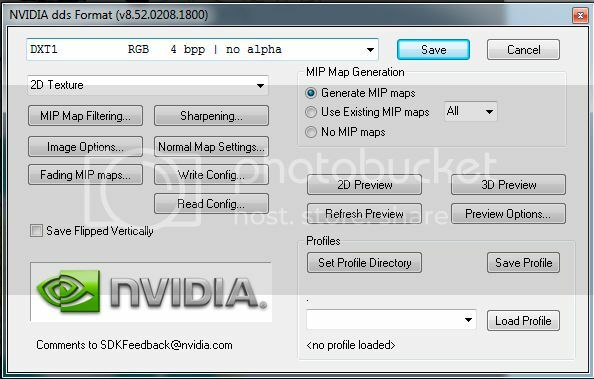 Then get nVidia Texture Tools for the Photoshop. 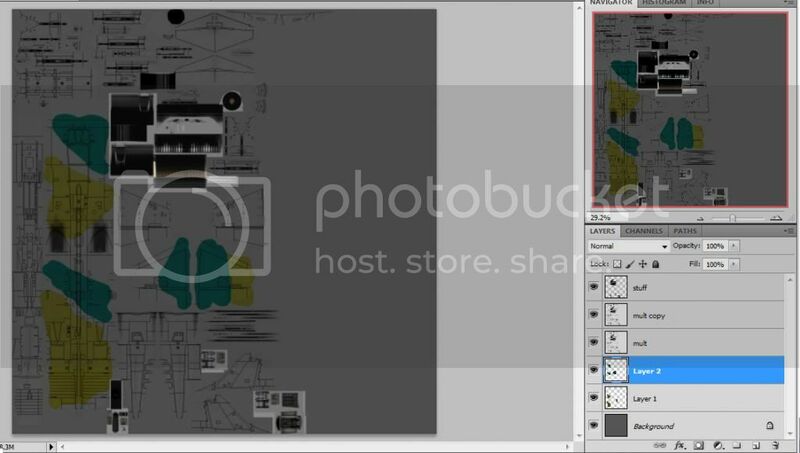 For this tutorial we'll be using F-104A template file. Make a new working folder, and copy the F-104A_Template.jpg there. 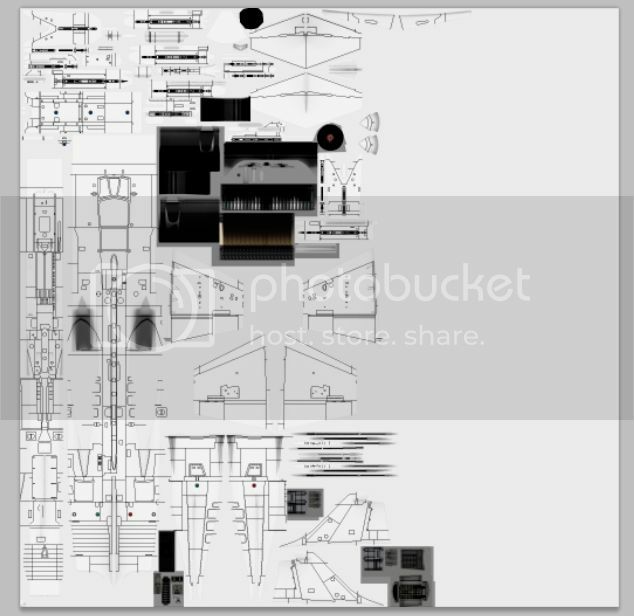 I suggest keeping a separate folder for each template, and name it after the plane the template belongs to. Open the Template file in PS. 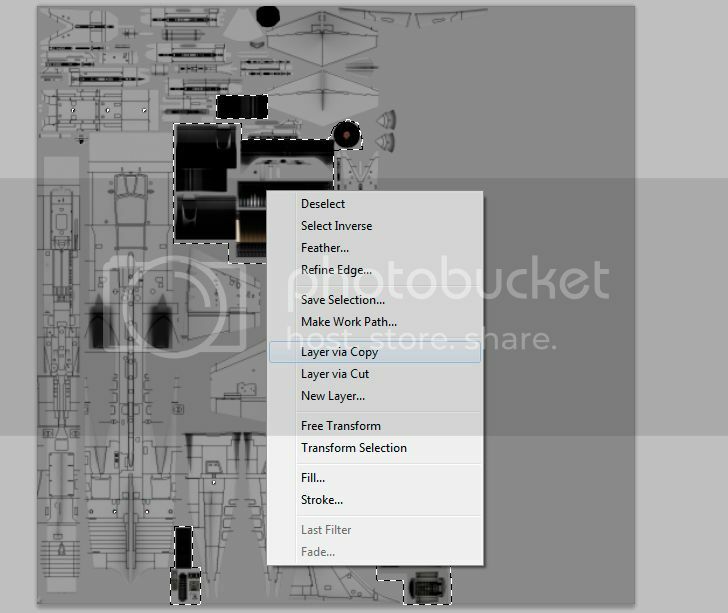 Now select all of the already colored parts, those are usually interiors, exposed mechanics, engine nozzles, Pitot tubes, strobe lights etc. This will be the only screen this large. Right click on the selected areas and then use Layer via Copy. You'll get new layer. I usually name it "stuff". Now you can properly save the file, so you won't lose any changes. Now, move back to Background layer, go to Select>All (or just press Ctrl+A), right click - Layer via Cut. You'll get a new layer, let's name it "mult". Now fill the background layer with white (255, 255, 255 white). 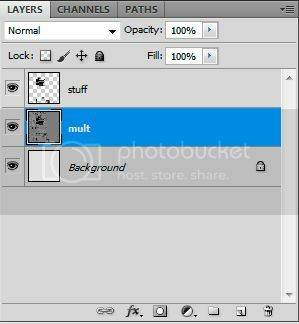 Now set "mult" layer properties to "multiply". Then go to Image>Adjustments>Brightness\Contrast. Set them to Brightness +90-100, Contrast -50, so the layer appears almost white. 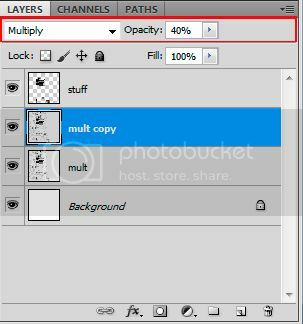 Now duplicate the "mult" layer; set the duplicate's opacity to 40%. Second "mult" layer must also be set to "multiply"
You might want to make additional brightness adjustments on both the "mult" layers. Play with the settings until you find the shade of white satisfying. In this case, I chose to add +70 to brightness at each of "mult" layers. Save the file. Basic template is complete. Now few advices. You might want to make a few screens of the plane in the game or hangar menu, then use a default texture file as a reference and add additional layer with labels that will help you to know which is a right or left side of some parts of the plane. 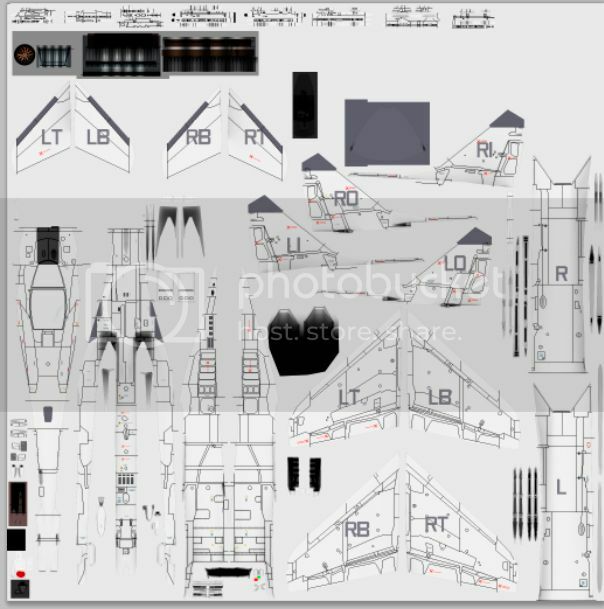 This is, for example, my MiG-29(9-12) template. R - right, L - left, T - top, B - bottom, O - outwards, I - inwards. When you color, put all the colors on background or additional layers, located between background layer and "mult" layers. If you're doing scheme that uses many different colors it is a good idea to put every color on a separate layer. It makes editing a whole lot easier. Country roundels and squadron insignia also go below "mult" layers. The texture is saved as .dds file. VT uses simple DXT1 textures. Beware that sometimes saving of .dds file takes about 20-30 seconds. The Photoshop did not freeze. You'll need to add a .skin file for it to work. It's a plain text file, containing the texture information. Each plane has one for the default texture, so copy it in your work folder and edit the name for the skin (the MenuName sting) and the name of skin file (Solid_1_Difuse sting). Do not edit others. (Unless you're planning to get a new specularity map for additional glow effects). The .skin file must be put into the same folder as the .dds file. Editing of the .skin file. But can you post it in the " tutorial" section so it could be always visible? But why do you do this instead of just applying an overlay filter to the regular template? I think someone mentioned that the way overlay behaves leads to different results between programs like Photoshop and GIMP. That was me but this doesn't look like that solution, the tutorial doesn't even use gimp and says to pirate photoshop. timeSymmetry wrote: Great tutorial John_Silver! I will post it in the tutorial section later, after other uses has given their advices and criticism. It's my first more of less serious tutorial and I want to polish it a little first. bornloser wrote: But why do you do this instead of just applying an overlay filter to the regular template? The color is more correct this way, when you use Overlay you'll need to put a few layers above to put the required color. This way you can, for example, take the textures Nergal01 has ripped in a neighbour thread and transfer color directly to your custom skin with Eyedropper tool only. It's going to be about 95% accurate. (Depends of how much effort you put in balancing the template colors). bornloser wrote: That was me but this doesn't look like that solution, the tutorial doesn't even use gimp and says to pirate photoshop. 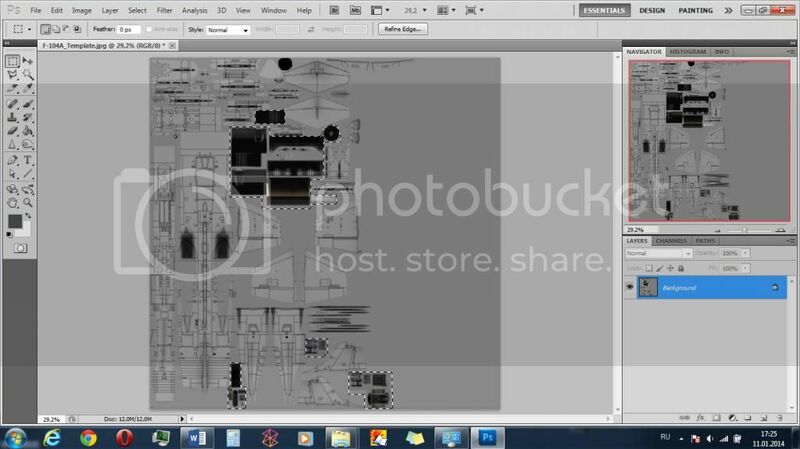 I'm not really familiar with GIMP, and this tutorial clearly states that its a Photoshop-only. Also, besides me being anti-copyright and pro-piracy (am an evil Commie from Siberia, after all), I believe that PS is ridiculously overpriced. Not everyone has that kind of spare money, especially to spend on making skins for the game. another thing you can try is having base layer with the template image, a duplicate layer on top of that with the the filter set to multiply, and then a white overlay on top of that. Then you merge those 3 layers to get your multiply layer that you can paint under. I am learning a bit about GIMP ( 2.8 ) to see if I can make a tutorial mainly to help those who use that program only. The process is very similar to this tutorial in fact. A lot simpler than I expected. I really ought to clean this up and put it in the tutorial section properly. Would it better to put it to Steam guides tab instead for more coverage? Nergal01 wrote: Would it better to put it to Steam guides tab instead for more coverage?